But seriously the possibilities are endless. From soups, to salads, casseroles or just pan-frying, you can’t go wrong. It is deceitfully healthy, it is almost unbelievable. And so filling! Here is a list of reasons why you have to make this for supper. If you want to know more about the exact health benefits of the resistant starch in this gnocchi check out my full explanation here. 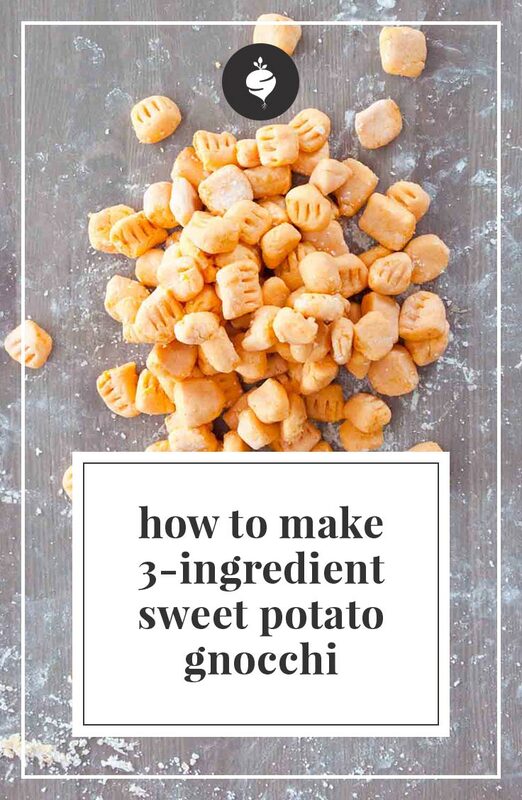 In the meantime, here is the step-by-step directions on making the perfect sweet potato gnocchi, in 15 minutes! The best part about this recipe is that it is approved for my free real foods detox program. 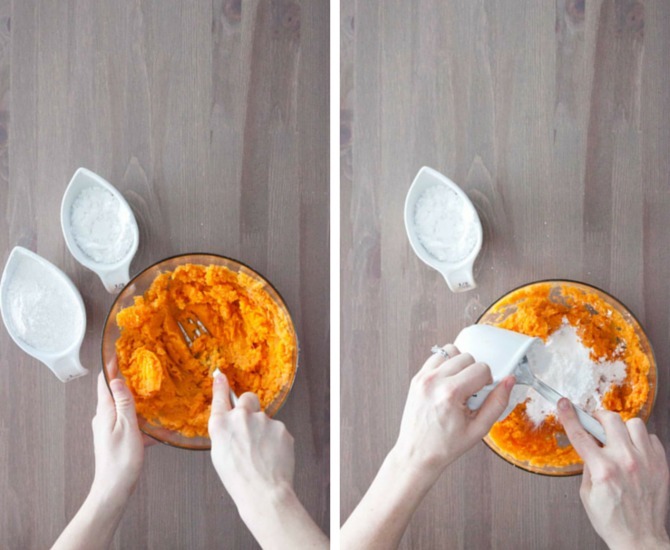 Mash warmed sweet potatoes in a bowl with a fork. Preferably you want to cook the sweet potato so it turns out dry. This means bake them in the oven without foil, oil or any other barrier working to keep the moisture in. Once mashed add in the arrowroot powder and potato starch. 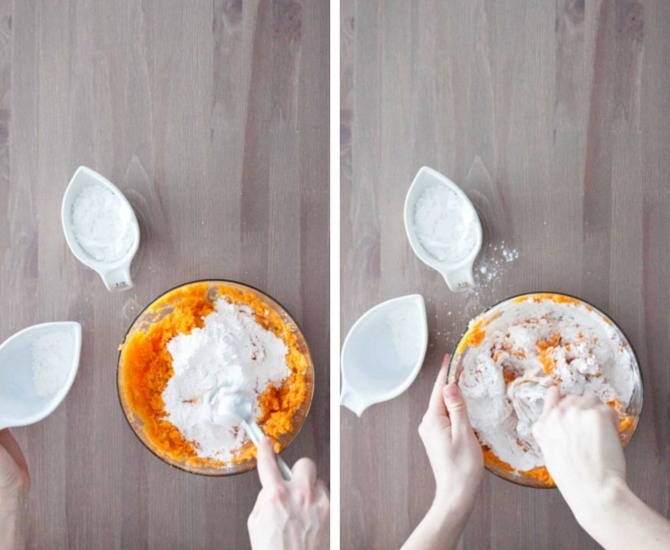 Mix the starches into the sweet potato until a soft dough forms. You may need to get your hands dirty and work the starch in by kneading the mixture. Add more starch or arrowroot powder if needed. The amount will vary slightly based off of the moisture content of your potato. 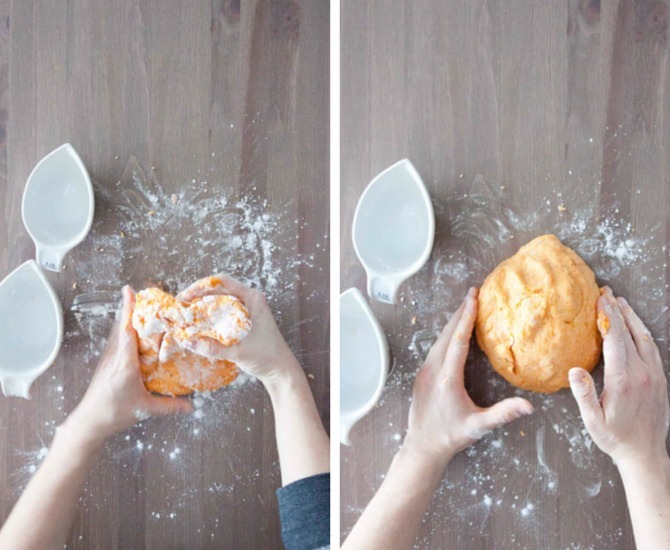 Add potato starch on a clean surface and knead until a soft dough forms. 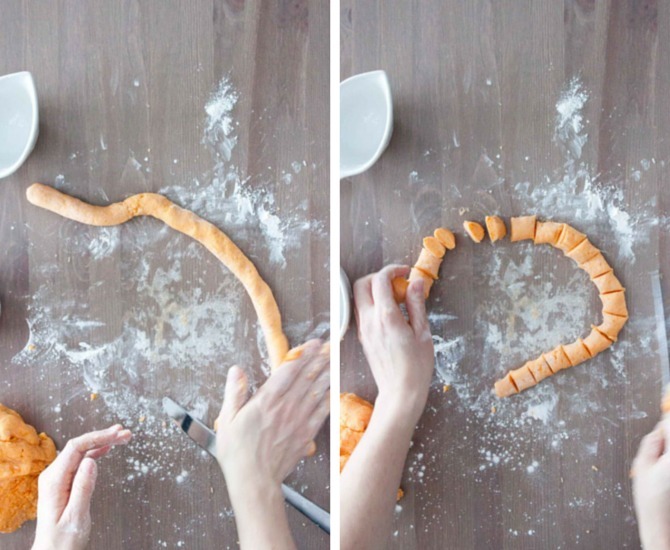 Cut dough into sections and roll out into a 1-inch rope. Cut into 1-inch pieces with a knife and separate. 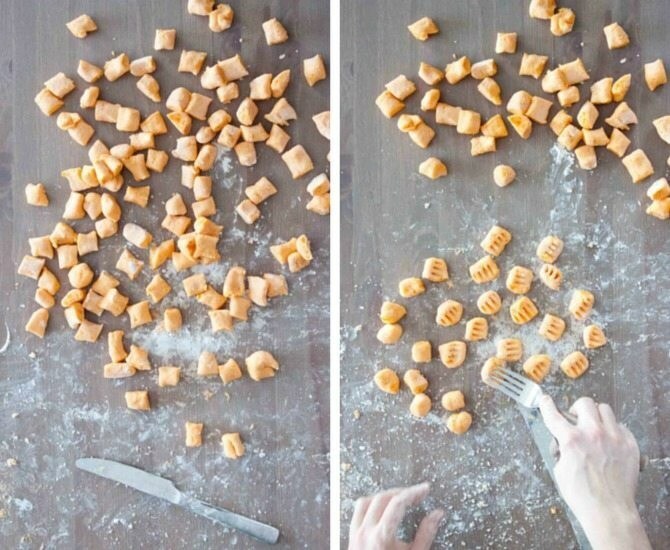 Once you have rolled and cut all of your gnocchi, press down slightly with a fork to create a visually appealing gnocchi. Now you are ready to cook it either via boiling, pan-frying, add to soup or store as is. 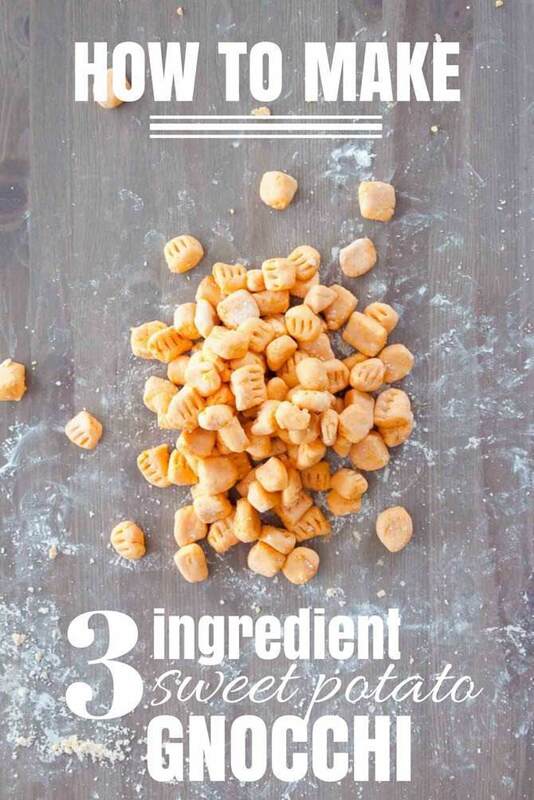 To cook the gnocchi via boiling, add water to a pot. Once it begins to boil add gnocchi one at a time to prevent sticking and cook until it rises to the top. Remove and let drain on a pan. Heat a skillet over medium heat and add oil. Once oil is sizzling place gnocchi in and cook until golden and crispy. 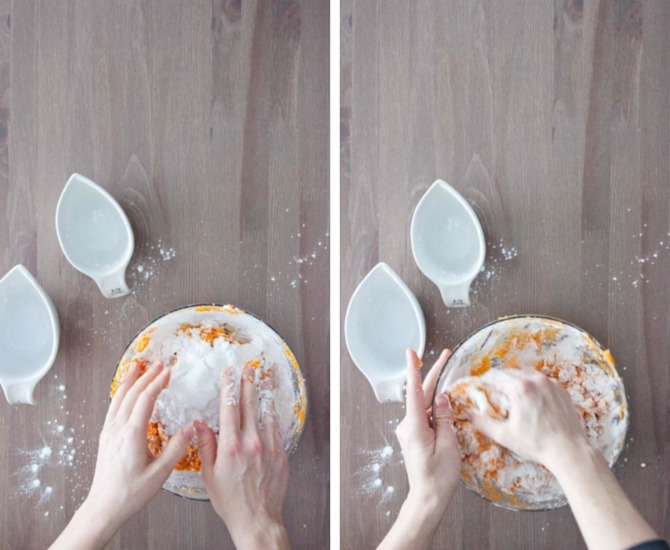 Flip gnocchi and repeat. Once your gnocchi is complete leave out to dry fully 2-6 hours. Once dry place in a bowl or baggy and place in the refrigerator for up to 1 week or freeze for future use.